I was introduced to Field Roast Sausages by Lauren, aka Whoa Wren, a couple years ago. At first I didn't want any part of them - I just wasn't a fan of sausages or hot dogs growing up. Even when I covered them up in mustard and ketchup they were hard for me to eat. Fast forward to present day and the Field Roast Apple Sage Sausages are one of my favorite meals. Even eating them plain is a treat. So you can say I'm a fan of Field Roast and I really enjoy their products, which brings me to their new Frankfurters! Forget every Vegan frankfurter you know, there isn't anything like this! The spicy, meaty frankfurter is the best I've ever had. The texture is nice and firm with a hearty bite. I can eat these without condiments or I can fix it up with ketchup, mustard and sauerkraut. I made mine on a cast iron grill but I can't wait to throw one on the gas grill outside. 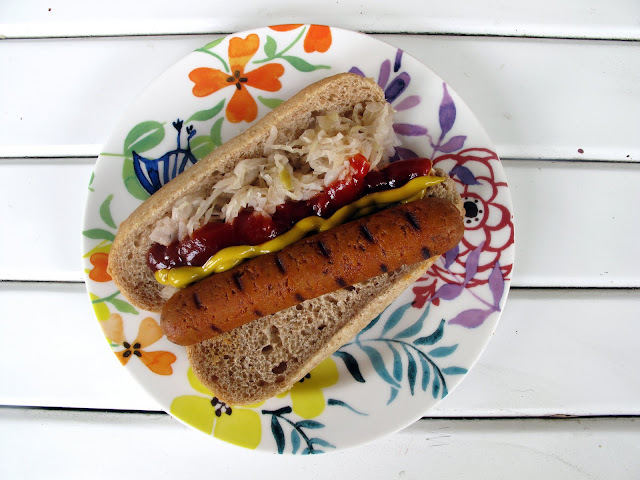 Even if you are not a fan of hot dogs, Vegan or otherwise, try these Field Roast Frankfurters and you will be converted! I MUST get my hands on those! I always did like hot dogs (maybe we're not twins, after all...sigh). But those look super-extra damn good. Field Roast can do no wrong. Those Apple Sage sausages are pretty awesome, I'll definitely give these a try. Ketchup..... on a hot dog or frank..... that is so not allowed once you are over 10. 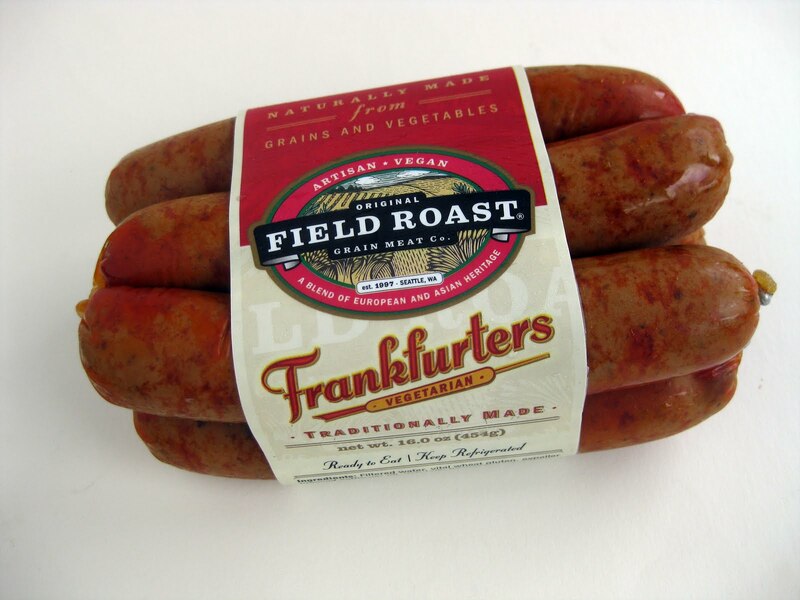 Those franks do look good, and I could really go for some of the Field Roast loaf (they do great as part of vegan kabob's) so I think I should order some now. What brand of hot dog buns are you using? I used Rudi's Wheat Buns. I just discovered your blog while trying to figure out a way to send Erik (vegan.com) a message about how supremely awesome these are. We used hollowed potato rolls four our buns. I ate my first one without any condiments for maximum flavor intensity.